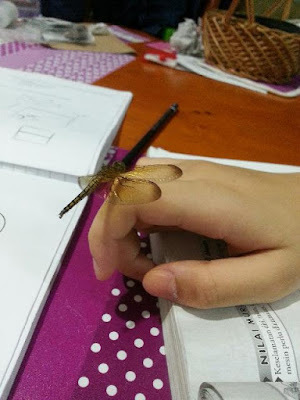 While my girl was busy doing her revision for her 1st term exam last week, a dragonfly came inside the house and hopped on her finger and remained staying there for me to take photo. My girls recalled a song "红青蜓" that they learned from school and started to sing. I am happy to hear them sing Chinese song which they hardly do.. They were fascinated with it, It flew away to it's freedom not long after that. That's good omen to me. Maybe a departed loved one came back to give love and encouragement for her studies. Sometimes I believe that so, she needs attain at least 80% average to maintain her scholarship in her new secondary school. What a surprise visit from the dragonfly. 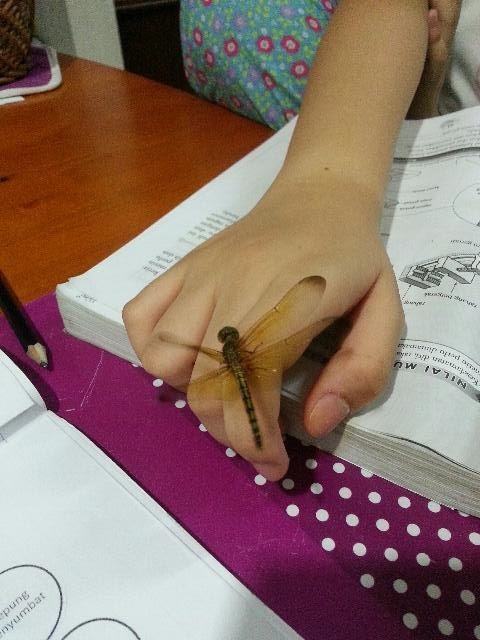 Nowadays, I don't see dragonflies visiting my garden. Maybe it is too hot for them. Yes, I hardly see them too. But this one came inside our house. That must be a lucky dragonfly. Hard to catch a dragonfly that well. Good luck to her in her exam. My kids also having theirs this week. Glad holiday is coming up!! Yes hope it will bring us luck. dragonfly is more friendlier looking than grasshopper, Can hardly see them flying around nowadays. 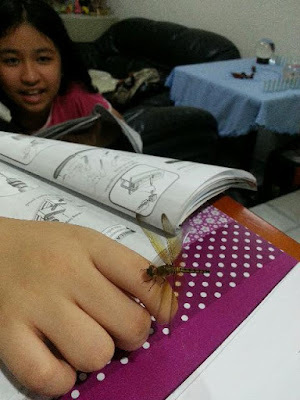 Seldom see dragonfly indoor. Good that you all didn't capture it.